GE Appliances’ new products, as part of its billion-dollar investment through 2014, continue to gain positive recognition. Today, BuildingGreen named GE’s GeoSpring™ hybrid electric water heater to its Top-10 list of green building products for 2013. GE began production of GeoSpring in February. 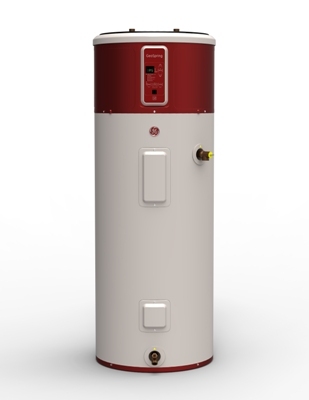 GeoSpring is an ENERGY STAR®-qualified water heater that was selected for its energy savings and its innovative technology. BuildingGreen’s Top-10 list was selected by BuildingGreen, Inc., publisher of GreenSpec and Environmental Building News (EBN). The products featured on the list are those added to the GreenSpec Directory or covered in Environmental Building News during the past year. “We are honored that the GeoSpring has been selected for the BuildingGreen Top-10 list,” said Stephen Downer, GE product general manager for water products.” With its innovative heat pump technology, the GeoSpring uses less than half of the energy of a standard electric water heater. * “There are very few products that can save homeowners as much money as the GeoSpring on their annual utility bills,” said Downer. GreenSpec, which is BuildingGreen’s online directory, lists more than 2,200 environmentally preferable products, with key insights on the green attributes of each product and the most critical green issues for each product category. All research on products is completed independently, with a heavy emphasis on remaining unbiased and providing the consumer quality information. BuildingGreen prides itself on its ability to deliver the awarded company and product wider recognition and enthusiasm, as well as, helping industry professionals and policy makers improve their environmental performance and reduce the adverse impacts of buildings. The official public announcement was made by Wilson at the U.S. Green Building Council’s Greenbuild conference in San Francisco.